Herbivory has a strong impact on algal distribution, abundance and community structure and may influence the establishment and spread of introduced seaweed species. In this study, we assess the potential regulating role of herbivory on one of the most invasive brown seaweeds: Sargassum muticum. 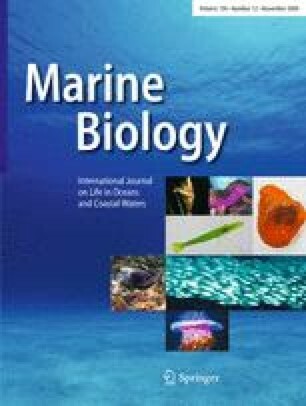 Multiple choice feeding experiments were conducted with 13 native seaweeds, S. muticum and 5 herbivore species from the Northwest, Southwest and South of Portugal. S. muticum was always the least or among the least preferred seaweeds and attained one of the highest growth rates of the tested seaweeds, with and without herbivores. The addition of herbivores increased the number of cases by 40% in which the invader had higher growth rates. Our results suggest that low grazing pressure on S. muticum by the recipient herbivore community may give the invader a competitive advantage over at least part of the native seaweed community, thereby contributing to the invasiveness of S. muticum along the Portuguese coast. Communicated by S. D. Connell. Carla A. Monteiro and Aschwin H. Engelen have equal authorship. We would like to thank to Kerstin Weidner for her help during the set-up of experiments and the staff of Ramalhete and Prof. Pedro Andrade for logistic support. This work was developed under the project “The invasive theory of the pest seaweed Sargassum muticum in Southern Portugal”, POCTI/MAR/55377/2004 (FCT, Portugal and FEDER). A. H. Engelen was supported by scholarship SFRH/BPD/7153/2001 of the Portuguese Science Foundation (FCT) and European Social Foundation.